Starting at 9:40 minutes ( first 3000m finish at 9:48, last 5000m at 20:46). In the movie the camera area to the right is colored red because this area is defined as a movement sensitive area and 15% of change will start recording. If athlete finally triggers the finish sensor the recording is still running and you as viewer get a better impression about the things that happened before the line. 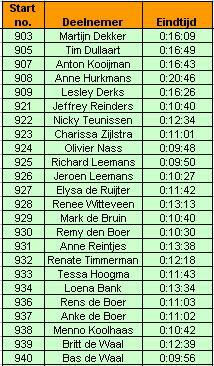 Final results of the day (3000m and 5000m together in one race.). The video presentation showed here is created with use of VirtualDub to remove all leading frames first. File is saved as direct stream AVI and processed with Winff (ffmpeg) to come from AVI to MP4 (h264). Thanks a good deal! I truly enjoyed reading this.Looking through these posts and the information you’ve provided I can appreciate that I still have a lot of things to learn. I will keep reading and keep re-visiting. Happy Camstudio user. Cool stuff! We like to know if we can use this for cyclocross and how much we have to invest. Much less as with other systems thats for sure. Thanks. Tony. Excellent material that you’ve offered here. I’ll glance forward to your next developments.